Repurpose Textile Scraps Into Beautiful Rugs! 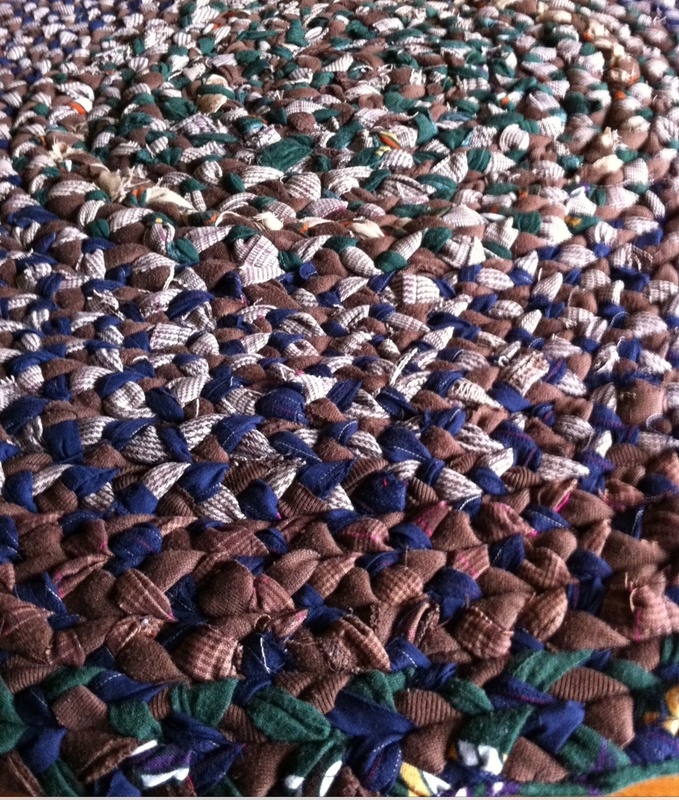 Do you have a creative craft or use for old textile waste? We’d love to showcase it on our blog! When Madison Gambacourt isn’t busy at TWD researching the green technology that will revolutionize how Canada manages its textile waste stream, she relaxes over sustainable creative projects at home. 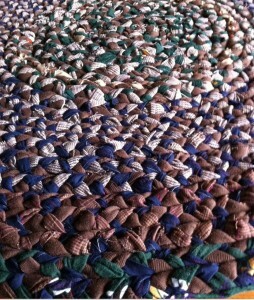 Her latest masterpiece is a rug made out of fabric scraps. The best part about this method, is it uses textiles that are beyond reuse quality. Thanks to creative methods like this, even textiles that may be destined for the dump or made into low value pillow stuffing can actually be used for something beautiful & useful! Her craftsmanship adds value to this material. These methods have great potential for fair-trade artisans looking for creative products they can make using a free medium. The ready availability of these scraps allows for more profit generating potential for struggling artisans. This process is time consuming, but for a dedicated crafter like Madison, that process is the whole joy. Its quiet, calming and easy on the mind, and yet challenging all at the same time. The end result is a stunning piece of art that has a useful purpose for years to come. If you give yourself enough time, these items make wonderful gifts. Every pound of textile waste that is reused instead of made from raw material saves 717 litres of water. By making herself this rug instead of purchasing a mass produced raw material version, she helped conserve approx 3,585 litres of water! Ideas: Make a bunch of these to donate to transition homes or domestic abuse shelters, to help furnish the new homes of their clients. You can also donate them to charity craft sales to help raise funds. 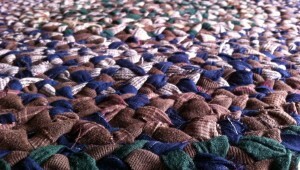 Call your local Furniture Bank to see if their clients might like a handmade rug to warm up their homes. Experiment! Try creating purses, appliqués’, wall decorations- this method can easily be expanded on! 2 pairs of pants, 1 pair of shorts, 2 shirts, and she used every shred of them-nothing was thrown out. You can use any combination of used clothing, just ensure that they blend well, not only in colour, but in weight too. < Too Many Plastic Bags? We Can Help!